The film, was released on 14 April 2017 and produced by Siddhanth and staring Darshan and DeepaSannidhi reuniting after a long gap. The film directed by Chintan also has actors SrujanLokesh, Adityaa, Shivadwaj and Kumar Bangarappa in the supporting cast. Trailer create a hallmark with just visuals, music and effects is something to watch out for Darshan’s fans. After its release, the movie has got huge success and acclamation from critics and kannada audience.Story revolves around Darshan’sChakravarthy is about an underworld don Shankar, Shankar (Darshan) is caring free guy having a habit of hunting Tigers in Kodagu. After his father who is a retired army officer sends him to Bengaluru in a search of Job, he accidentally becomes an underworld don. Arjun Janya has comeup with a brilliant music and background scoring, which will a value added element for this film, especially ‘OnduMalebillu and tittle track Chakravarthy is one of the popular tracks. First time in history of challenging star Darshan career, his latest movie Chakravarthy, will have screening at 12am in Bengaluru, Mysuru, Shivamoga and in other parts of Karnataka. The film will be released in as many as 300 theaters in Karnataka. 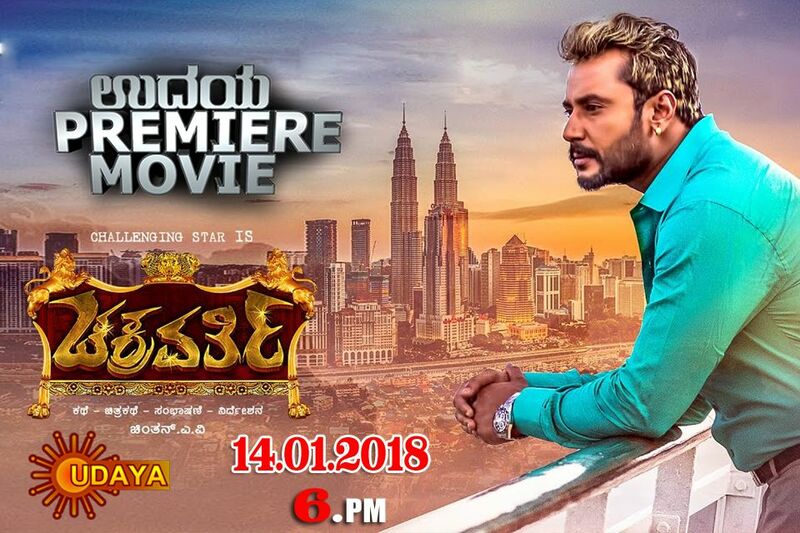 And now for the first time in Kannada Television, Udaya Television Premier Movie “Chakravarthy” is been telecasted on Sunday (14.01.2018) at 6 PM.